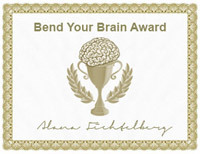 The "Bend Your Brain" Award is presented to a student who has shown examples during the week at home, school, or in sessions of facing a problem and then dealing with it in an appropriate and “expected” way. It would have been easy to break into pieces and be in the “Red Zone.” Instead they demonstrated calmness, flexibility, and figured out a better way. 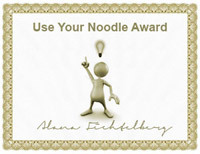 The "Using Your Noodle" Award is presented to a student who shown examples of facing a problem and using his brain, eyes, and body to find an "expected" solution to the problem. 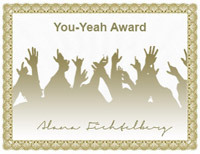 The “You-Yeah” Award is presented to a student who has shown that he/she was thinking about or helping others either at home, during the session, or at school. That other person now has good thoughts about the award winner! You made someone else feel good about themselves and about you!